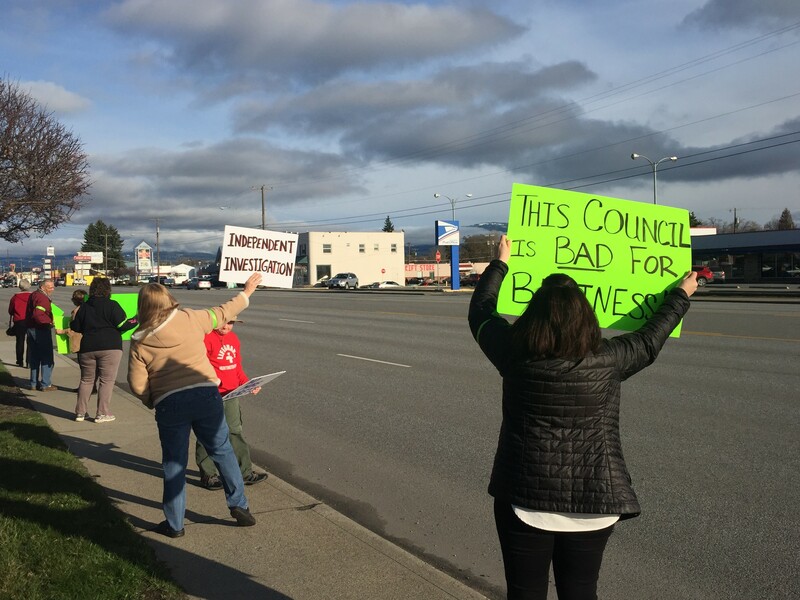 A group of protesters held signs outside Spokane Valley City Hall Tuesday evening, calling for an investigation into the firing of City Manager Mike Jackson. "There should be an investigation," said Mary Pollard, who organized the protest. "There's just too many troubling things about this, and it doesn't make sense." On Feb. 23, City Council voted 4-3 to force Mike Jackson to resign. Jackson had been city manager since 2010. He is on paid leave until his contract is officially terminated. The four council members who voted to oust Jackson represent the new City Council majority: Mayor Rod Higgins, Deputy Mayor Arne Woodard, Councilman Ed Pace and Councilman Sam Wood. The decision came as a surprise to the other three council members, two of whom are calling for an independent investigation into whether the majority broke open-meetings laws by making a decision to fire Jackson in private. (Read more about this decision and the overall dynamic on City Council in this week's Inlander). Jackson's most recent performance review, in August 2015, had little negative feedback. The council majority gave no reason at that meeting for firing Jackson, only stating it was in the best interest of the city. The lack of transparency irked many of the protesters, who saw it as a power play by the council majority. They held signs in front of City Hall on Sprague Avenue, including ones reading "Justice for Jackson" and "This Council is Bad for Business!" The group included former mayors, councilmen, and members of the planning commission. 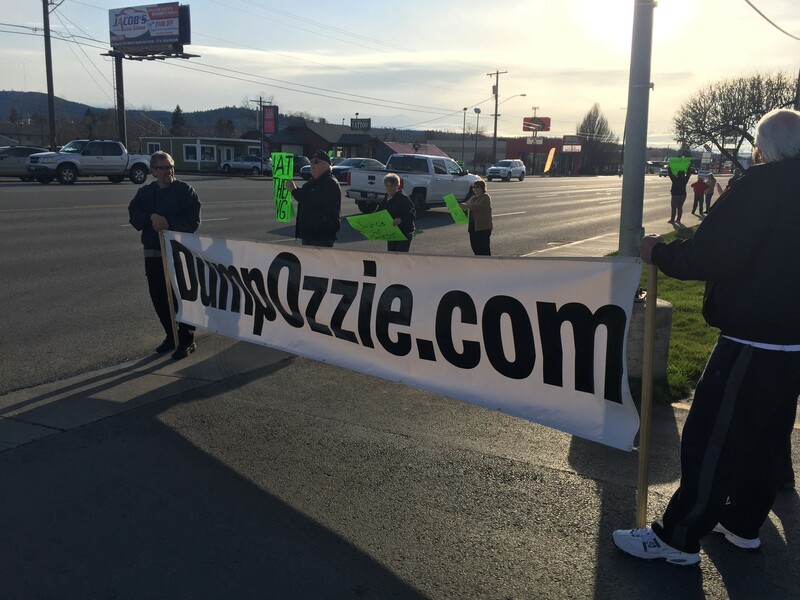 A few counter-protesters who supported the firing of Jackson took the opportunity to also express their dissatisfaction with Spokane County Sheriff Ozzie Knezovich by holding a banner, right in front of the other protesters, that read "DumpOzzie.com." Later, at the City Council meeting, many of the protesters wore green bands around their arms and spoke in the public comment period. Former mayor Tom Towey said the lack of transparency looks bad for the city. Pollard called Jackson's firing the "shot heard around Spokane Valley." Others spoke in support of the council, saying they had every right to fire Jackson. Most of the protesters were gone by the time council got around to discussing whether or not they would allow an independent investigation into Jackson's firing. The majority members said they might be open to such an investigation, but did not even want to discuss the matter until Jackson's separation from the city is finalized at the end of the month. Councilmen Dean Grafos and Chuck Hafner pressed the majority on this point. "You are saying tonight that you have no problem with having an independent investigation?" Grafos asked Higgins. "I'm saying I have no problem with discussing it, Mr. Grafos," Higgins said. "Don't put words in my—"
"So you're saying no? Tonight you're saying no. You want to discuss it, kick the can down the road," Grafos pressed. "You're putting words in my mo—"
"No I'm just asking: Do you want to have an investigation?" Grafos asked again. "We want a discussion," Higgins responded, "about having an investigation." Hafner then pointed out that such a discussion was happening at the moment. Other majority members then said they couldn't discuss it freely until Jackson's separation was finalized. After some more bickering, the discussion was put on the pending agenda.